London Breed is the 45th Mayor of City and County of San Francisco. Mayor London Breed is the 45th Mayor of San Francisco and the first African-American woman Mayor in the City’s history. 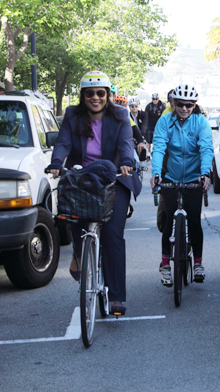 Prior to being elected by voters in an historic June 2018 election, Mayor Breed served as Acting Mayor, guiding and leading San Francisco following the sudden and tragic passing of Mayor Edwin M. Lee. Mayor Breed is working to create a more equitable and just San Francisco for all. Since becoming Mayor, she has focused on helping the city’s homeless population into care and shelter, including opening up over 330 new shelter beds and helping nearly 1,000 people exit homelessness. To make San Francisco more affordable in a time of increased housing costs, she is focused on adding more housing for residents of all income levels by streamlining bureaucracy and cutting permitting times while also investing in affordable housing, including moving forward plans for a $300 million affordable housing bond. 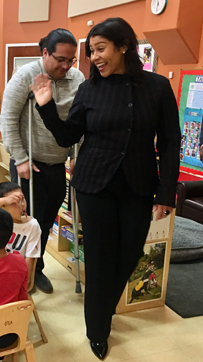 She has added mental health stabilization beds and authored conservatorship legislation to help those suffering from mental health and substance use disorder on San Francisco’s streets. To ensure that all San Franciscans have access to a thriving economy, she has invested in workforce development opportunities for local residents, including her Opportunities for All initiative, which provides paid internships for youth to prepare for their future careers. Mayor Breed has pushed to make San Francisco a cleaner and safer city by expanding street cleaning and increasing police foot patrols in order to stabilize areas of need. She is committed to furthering San Francisco’s leadership in combating climate change by pushing ambitious environmental goals, including transitioning to 100% renewable energy by 2030. Mayor Breed served for six years on the San Francisco Board of Supervisors, including three years as President of the Board. During her time on the Board, Mayor Breed passed legislation to create more housing along transit corridors and prioritize residents for affordable housing opportunities in their communities. She helped to reform the City’s emergency response systems, secured funding for San Francisco’s homelessness support network, and enacted the strongest Styrofoam ban in the country. She also worked to implement the Rental Assistance Demonstration (RAD) program to rehabilitate and preserve thousands of long-neglected units of permanently affordable housing. She is a native San Franciscan, raised by her grandmother in Plaza East Public Housing in the Western Addition. She graduated with honors from Galileo High School and attended the University of California, Davis, earning a Bachelor of Arts degree in Political Science/Public Service with a minor in African American Studies. She went on to earn a Master’s degree in Public Administration from the University of San Francisco. Before her election as Supervisor, Mayor Breed served as Executive Director of the African American Art & Culture Complex in the Western Addition for more than over a decade, transforming the center into a vital, financially-stable community resource that provides after school arts and cultural programs for youth and seniors. She also served as a San Francisco Redevelopment Agency Commissioner for five years and in 2010 was appointed by then-Mayor Gavin Newsom to be a San Francisco Fire Commissioner, where she served until her election to the Board of Supervisors.